…wow… Do you actually LOOK for this stuff, or is it advertised in bight neon colors “Innuendos Inside”? When you’re as immature as I am, EVERYTHING jumps out at you with innuendo. On a more serious note, I churn through an awful lot of Golden Age Comics to get a relative handful of these. The further forward in time you go, the less likely you are to hit something funny, because the language has (obviously) shifted over time. 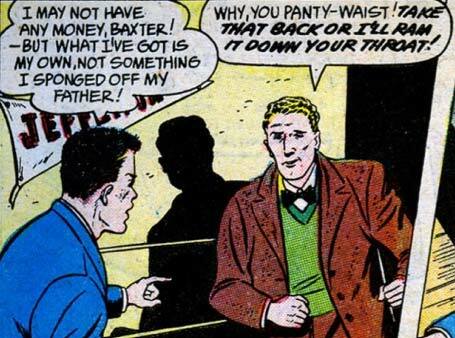 On this particular panel, what really caught my eye was “I sponged off my father.” EEEEEWWWW!!! !